Molded from hard-wearing ABS plastic, these flexible, lightweight jumbo painting knives won't corrode or rust like traditional knives — and their handles will never detach! 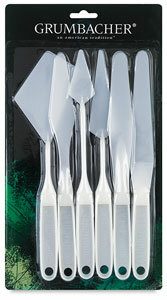 Each knife is large (10" or 25 cm long), and well-balanced for excellent control. Indentations in the handle makes them easy to hold and manipulate during long painting sessions. Each knife possesses the appropriate level of flexibility for its shape and purpose. Perfect for mixing, impasto techniques, and multimedia, these knives can be safely used with all paints, mediums, and solvents. Their neutral, off-white, non-glare tone enhances their color-mixing capability. They're also extremely easy to clean.